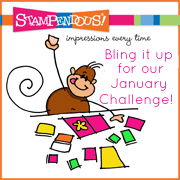 Just Jingle: Stamendous! Saturday - in FRANCE! I used the Charm Collection Perfectly Clear set along with a bit of spray ink, some fabulous Shabby Blue Emossing Enamel, and a bit 'ole May Arts ribbon! Sweet card! 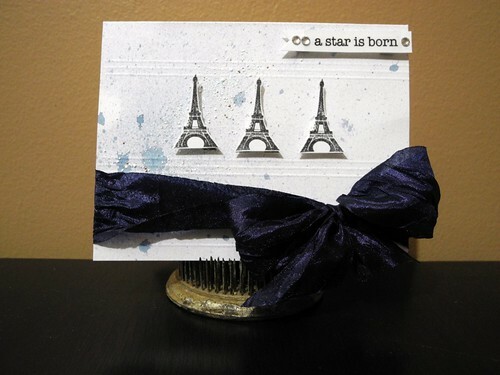 love the big bow and the lovely embossed eiffel towers! I love it an Eiffel lot :D. Seriously I'm a total Eiffel Fan! I've always wanted to go to Paris ... you are amazing. And now I have to go visit all these other amazing people too! When you posted this on the FB gals, I didn't see the flecks of Shabby Blue EE. Along with the mists, and the CAS feel, this is a wonderful card! Love all of the dimension.The mist with the shabby blue creates such a cool look. Fabulous (again)!!!!!! What a fun card! Love the big bow. adorable card and congrats on your pub!!! happy for you!! 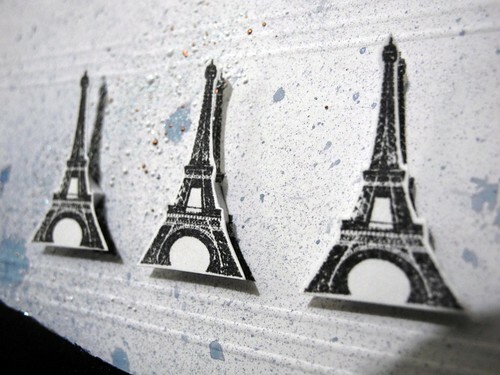 how gorgeous, love those little Eiffel towers! love the shabby blue mist! and the awesome CAS feel of your card is still unmistakable! lovely! ohh love bling! I'll be back tomorrow to add my post! Oh, I think this is soooo darling!! I hope you had a good weekend! This is super cute, Jingle! Wish we could send you to Paris for real, but this is definitely the next best thing!